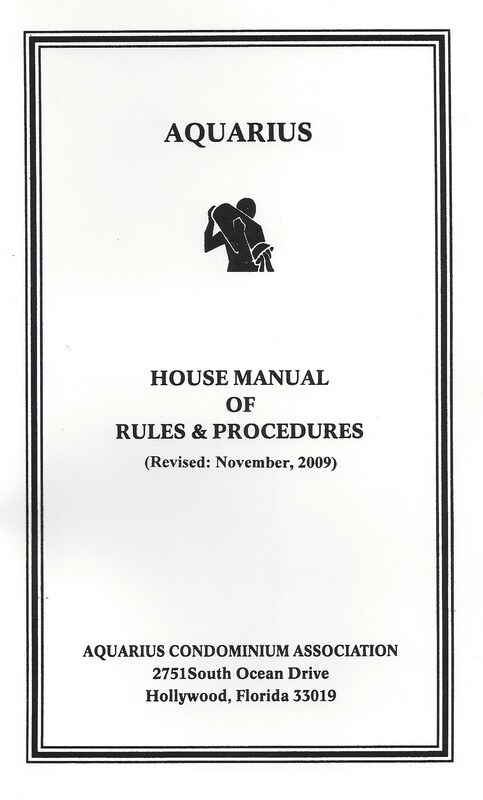 20150319_House Manual of Rules and Procedures-2009 Printer Friendly version of this page pdf format – click here Printer friendly file opens in a new TAB. The members of this Committee to update and re-issue the House Manual of Rules & Procedures wish to express our appreciation to the committee preceding us, for the excellent job they did three years ago; and to the current Board and Manager for their input. We have found all of this an invaluable guide. Wherever possible, we have repeated those original instructions that are still applicable, and have added and/or modified such regulations only as necessary to reflect changes in State Law, the Declaration of Condominium; our By-Laws; technology and today’s lifestyle. These Rules are not all inclusive. Please read your Condo documents for more detailed regulations governing the sales or leasing of apartments, as well other important issues. We repeat the advice set forth in the original Manual and strongly advise everyone to review the entire manual at this time and to keep it handy for future reference. We further urge that it be made available to all guests in your home and that you acquaint all domestic help and in-house health service providers with its contents. Unit Owners are expected to maintain their apartments in first class condition. Failure of air conditioners, kitchen appliances and/or bathroom fixtures can cause great damage, not only to the pertinent apartment, but to other apartments and common areas as well. For the convenience of unit owners air conditioning fitters are replaced every three months by Management. Limited maintenance and repairs are performed by Management only on an emergency basis. Management maintains a list of qualified outside repairmen in the Office who are available to assist unit owners with general repairs, for a fee. It is recommended that unit owners enter into a Service Contract with a professional service company for the maintenance of all appliances and simple repairs. Unit owners are responsible for making sure that anyone hired by them to perform work in and around their respective units, is licensed, cleans up any mess and property disposes of any waste. Payment of maintenance fees and assessments are due on the first of each month. Any payments made on or before the tenth of the month shall not bear interest. All payments made after the tenth of the month shall bear interest at the highest rate allowed by law. In addition, payments made after the tenth of the month in which they are due are subject to a fine in an amount equal to the greater of $25 or 5% of each late installment. Unit owners, their families and guests (including children) shall not appear in the Main Lobby, halls, elevators or other public areas unless properly attired. Proper attire means footwear, and coverings both above and below the waist (i.e. pants, shorts, skirts, shirts, tops, etc.). Bathing attire may be worn in the restaurant so long as it is not wet, and is covered. Bathers must use designated entrances to the building. Anyone wearing wet bathing attire may not use the passenger elevators at any time, and must use the service elevators only. Bicycles may not be ridden or stored in the garage. Space and racks for bicycle storage have been provided in the personal storage areas located on the garage level of each building. You store your bicycle there at your own risk, and each bicycle should be secured to a rack with a lock. CAUTION: It is the responsibility of each bicycle owner to see that the doors to the personal storage areas be kept locked after they leave the storage area. As parents, grandparents, aunts, uncles, sisters or brothers we, at the Aquarius, strive to be a child-friendly place. As responsible adults, we also know that children need both boundaries and proper supervision. Accordingly we ask that the simple rules below please be observed and that you have any of your guests with children familiarize themselves with our rules and abide by them. Minors under the age of eighteen, who are not resident children of a unit owner, will not be permitted to occupy an apartment without an adult in the residence. Children are not permitted to play in the public halls, stairways, public rooms, lobby or elevators. Children may play in the pool room, card rooms, and on the shuffleboard courts only when under the active supervision of an adult. Under no conditions whatsoever, are children under age 12 permitted to use any elevator unless accompanied by an adult. Unit owners are responsible for any damages caused by their children and/or their guests. Claims for personal injuries or damages caused by children are the responsibility of the unit owner host, NOT THE ASSOCIATION. As with any other rules, these rules for children will be enforced, not by other unit owners, but by Management and Security. Association cleaning equipment and supplies are not available for unit owner use. When closing your apartment for a period of time, you should be mindful of several items. Please study the following CHECKLIST carefully. STORM SHUTTERS – The closing of storm shutters is the sole responsibility of each individual unit owner, and is MANDATORY. ELECTRICITY – Turn off all breaker switches in the box except those necessary to operate equipment you desire to leave on during your absence. AIR CONDITIONING As the climate here in Hollywood Beach is often humid, it is advised that you leave your air conditioner on in your absence (a setting of between 78 – 80 degrees would be appropriate), or leave it on a timer, in order to prevent the formation of mold; which can be life threatening to you and/or your neighbors. If left running, you should arrange for the air conditioner to be inspected and the fitter and drain checked periodically. Overflow water due to clogged drains can cause serious damage to your apartment, hallway carpets and the apartments below you. WATER SUPPLY – The water supply to your apartment should be turned off. The main shut-off valve can be found in the heating/air conditioner closet. TERRACES – Furniture, flower pots, plants and anything that might blow about in a high wind should be brought inside the apartment. WINDOWS AND DOORS – Make sure all your windows and doors are securely closed and locked. For those of you who do not normally leave a second set of automobile keys with the Office, we strongly advise you to do so in case your vehicle needs to be removed due to an EMERGENCY. In lieu of leaving your automobile keys with the Office, please leave it with a friend/neighbor and advise the Office. TELEVISION SETS, ELECTRIC CLOCKS/RADIOS, ETC. – Remove wall plugs or turn off the appropriate circuit breakers. REFRIGERATORS – It is suggested that all food be removed, all water and electricity to the refrigerator be turned off, and the door(s) propped open. DRY FOOD ITEMS – Do not leave any grain type of food items (i.e. – cereal, crackers, flour, corn meal, party snacks, etc.) in your cabinets. Remove even unopened packages of these items. UNIT OWNERS: Please let the Office know the date of your planned departure and the estimated date of your return. GUESTS: Unit owners must leave the names, addresses, phone numbers and arrival & departure dates of any guests they plan on allowing to use their apartment; both in their absence, and when they are in residence. All unknown persons attempting to enter the building will be prevented from doing so, even if they claim to have your permission to stay at your apartment – UNLESS the Office has prior knowledge of their coming AND Security has received written permission to that effect. These suggestions are both for your protection and that of your neighbors. CHANGE OF ADDRESS — Change of address cards should be filled out and left with the office so that you can be contacted in case of emergencies. Also make sure you notify our mail carrier (so that mail can be forwarded to you); stop phone and Internet service (if you so desire); and suspend your newspaper service. — KEYS — IT IS MANDATORY THAT A SET OF KEY(S) TO YOUR APARTMENT BE LEFT UNDER LOCK AND KEY IN THE MANAGER’S OFFICE, AT ALL TIMES – IN CASE OF AN EMERGENCY. If that is not done and access to your apartment is required, the door may have to be broken down; in which case you will be billed for all expenses incurred including a replacement door. Please see #6 above with respect to leaving a duplicate key to your vehicle with either the office or a neighbor. All complaints, whether about infractions of any of the rules contained in this Manual by Owners and/or their guests; or about building employees, operations or conditions, are to be directed in writing to the Board of Directors or the Manager of the condominium. FIRE CODE REGULATIONS REQUIRE THAT ALL FIRE DOORS at the end of the corridors on every floor MUST remain closed at all times. These doors should be used for EMERGENCY PURPOSES ONLY. It is against the law to leave any items in hallways or on staircase landings as they are considered Fire Hazards. Violators will be subject to prosecution by the City. Owners shall be liable for damages to the building caused by any member of their family, guests, lessees, domestic help and/or employed health care providers, or by any persons delivering or removing items to/from an apartment, or by repairmen working for a unit owner. Children under 12 are not permitted in elevators unless accompanied by an adult. This is for child safety purposes; as in the event of a fire or elevator failure. No wheeled vehicles of any kind, except wheelchairs, are allowed in the passenger elevators. For safety purposes, it is requested that people using motorized chairs please use the service elevators, when possible, as the doors are wider and the interiors both wider and deeper. Persons in wet bathing suits may not use the passenger elevators at any time. An EMERGENCY TELEPHONE is located in every elevator. No dialing is necessary. Just lift the receiver and Security will answer. All furniture and other bulky items MUST be transported in the service Reservations are required to use the service elevators for move-ins and move-outs, and must be made no less than 48 hours prior to the expected move-in or move-out. Additionally, move-ins and move-outs can only be done on Mondays through Fridays; 8:00A.M. to 4:00 P.M. The delivery of these items in non-move-/move-out situations, also require advance notification to the Office. Grocery carts and other wheeled vehicles (other than wheelchairs) MUST use the service elevators. Persons in bathing suits coming from the beach, pool or saunas MUST dry themselves BEFORE entering the buildings and MUST use the service elevators. All service personnel (repairmen, delivery people, cleaning services, etc.) MUST use the service elevators, not the passenger elevators. All Unit Owners MUST obtain an electronic access strip plus an Aquarius vehicle parking identification parking sticker for each of their vehicles that will be parked either in the on-site garages and/or the parking lot across the street. Vehicles without these items are subject to being towed away. It is recommended that you lock your car at all times. Anyone temporarily occupying a parking space other than his/her own without permission, because their own space has been illegally occupied, must advise. All illegally parked cars will be towed at the owner’s expense. Any Unit Owner, who wishes to permit another Unit Owner to use his/her parking space during an extended absence (e.g. during the summer) must file a written statement to that effect with the management. Anyone given permission to use an Owner’s parking space MUST first go to the office to obtain a Temporary Parking Permit and an access device. This Temporary Parking Permit must then be displayed, as directed by the office. FAILURE TO FOLLOW THESE RULES MAY RESULT IN THE VEHICLE BEING TOWED AWAY. If your space is to be left vacant during your absence, please notify Security or Valets so it can be used by the building during your absence. Electronic gates to the lower garage are located on the South and North The gates are automatically opened by the use of a special device that must be obtained from the management. Devices to access the parking lot across the street may also be obtained from management. Exit to the street from the lower garage is limited to the South driveway. The gate will open automatically as the driver passes an activator located in the driving lane approaching the garage door, or if he/she drives slowly to within 4 feet of the gate. Do not proceed through the gates on someone else’s activator as it may result in damage to both the gate and your automobile. For your protection and that of others, the driving speed for both upper and lower garages is limited to 5 miles per hour, and headlights MUST be kept on at all times while driving in the lower garage. Pedestrians MUST NOT use the electronic gates for entrance or exits. To avoid conflict with your neighbor, please park properly between the lines. Trailers, campers, vans, motor homes, trucks, and other vehicles owned by Unit Owners that are not conventional private passenger vehicles, may not park in a residential parking area or anywhere else on the premises, and except for loading or unloading in designated areas, MUST use the parking lot across the street. Workmen working in the building also must use the parking lot across the The open parking lot across the street can be accessed by using special devices issued to all unit owners, by the Office. Advance notice (including names and addresses) of all guests visiting for the day MUST be given to the Security Desk in a timely manner. Seven (7) days advance notice is required of all guests staying overnight; which notice shall contain: the guest(s) name(s), addresses and dates of arrival and departure. It is up to each unit owner to supply apartment and outer door keys for any/all guests using their apartment in their absence. The Office and Security Force cannot and will not supply a key from the emergency key file. No guests will be allowed to enter the buildings if these rules are not followed. WARNING: FAILURE TO COMPLY WITH THESE PROCEDURES WILL RESULT IN YOUR GUESTS BEING DENIED ACCESS TO OUR BUILDINGS AND YOUR UNITS. Approved visitors arriving by automobile are not permitted to park their cars. They must use our valet service. In the absence of the owner and his/her car, guests occupying the apartment have the privilege of using that owner’s parking space so long as the owner notifies the office in advance and paragraph 4 of the section headed GARAGE AND PARKING AREAS (relating to obtaining and displaying Temporary Parking Permits), is complied with. Within 30 days after the publishing of these Rules & Regulations, and in January of each year thereafter, each Unit Owner must submit a list of all “Immediate Family Members” to the office. “Immediate Family Members” means the owner of a condominium unit and the owner’s spouse, and such person’s parents, grandparents, children, grandchildren, brothers and sisters. Health Club showers are not to be used for removing sand. Facilities at the base of the beach staircase are provided for this purpose. Health Club showers are not to be used by anyone except owners and their guests who are using the Health Club exercise equipment and/or saunas. No one under 16 years of age is permitted entry to or the use of either the sauna or exercise room, unless accompanied by an adult. Children under 12 years of age are not permitted with or without an adult. As a safety precaution, avoid being alone in the sauna or steam room. As a further safety and security precaution, the two Health Club areas containing the machines and other workout equipment, are monitored by our security cameras 24 hours a day. Unit Owners and/or their guests must first learn how to properly use all Health Club equipment that they plan to avail themselves of, prior to their use. Use equipment with care. Return all equipment to its proper place for the next user. When leaving please turn off all lights, televisions and electrically operated. Leave all rooms clean and tidy. Panic buttons are available in the Health Club to notify Security of any emergencies. Unit Owners are required to carry hazard and liability insurance on their respective condominium units and each Unit Owner must provide the Association with proof of such insurance. Additionally, all Unit Owner insurance policies are required to include “loss assessment” coverage of no less than $2,000 per occurrence, and must name the Association as an additional insured. Automobiles: All Unit Owners are required to continuously maintain automobile insurance in force on all of their vehicles parked on Association Property (whether or not the Unit Owners are in residence), in amounts and coverages that equal or exceed those required by the State of Florida on similar vehicles. The selling and/or leasing units must be done in strict accordance with the rules and regulations described in the Declaration of Condominium and these Rules & Procedures. These rules require, among other things: 30 days advance written notice to the office, 30 days advance review of all sale/lease documents (which must be submitted with the notice), the scheduling and completion of interviews, and payment of all required fees. (Full information is available at the office). Failure to adhere to the Rules can result in a delay or voiding of the sale or lease. An application for resale or lease (forms available at the Condo Office) MUST be completely filled out, signed by the proposed new Owner(s) or new Lessee(s) and delivered by the present Owner(s) to the Association at least 30 days in advance of any scheduled closing. No Unit Owner may lease or rent his/her Unit during the first 12 months of After a one-year waiting period only one rental lease is permitted within any twelve-month calendar period, (which cannot be for less than three months). Units may not be subleased. A Unit may be leased only with the written approval of the Association (which has the right to reject any potential Lessee for any reason) and only to single families. Two-bedroom Units may be leased only to a single family with not more than four occupants; a convertible unit to a single family with not more than four occupants; and a one-bedroom unit only to a single family with not more than three occupants. Unit Owners may not rent or lease to Corporations, LLCs or other similar NO UNIT MAY BE PURCHASED BY OR IN THE NAME OF A CORPORATION OR LIMITED LIABILITY COMPANY, NOR MAY THE TITLE TO ANY UNIT BE SUBSEQUENTLY TRANSFERRED TO SUCH ENTITIES. All applicants, including Husband and Wife when applicable, must be interviewed personally by the Screening Committee. A transfer/Leasing fee must be included with the respective application. The fee will be refunded if the application is not approved. Please take all precautionary measures to keep from disturbing the peace and tranquility to which your neighbor and fellow unit owner is entitled in his/her own apartment. Do not operate any sound producing instruments, radios, DVDs, TVs, stereos, MP-3 players or other music/sound making devises, above conventional loudness. Any such device being played on terraces are to be used with discretion, as the sound carries into many of the surrounding apartments. The condominium Office is located on the Garage Level of the North Building, and is open for business Monday through Friday (except Holidays), from 8:00AM until 4:00PM. Posters must be limited in size to not more than 8 inches by 11 inches. Material must be given to the Managers secretary, in advance, to be posted in the designated areas on the bulletin boards. All signs must be suitable in appearance and approved by the Manager. Posters should be removed immediately after the advertised event. Easels for larger posters may be used, with permission of the Manager, for very special events such as cruises, installations, etc. Limited use of the Bulletin Boards located at the garage level of each tower, is available to Unit Owners for the sale of personal property (including their units). A package receiving room is located in the main lobby at the Security desk. Please make arrangements to pick up your deliveries as soon as possible after notification of arrival. Packages not picked up within 24 hours of notification will be stored by Management. The Association shall not be responsible for any loss or damage to such property. However, normal care and surveillance will be accorded them while they are in Association custody. Advise your trade’s people to make deliveries through the service entrance of the North Building. The Post Office letter carrier will leave a notice in your letterbox when a USPS package has been left for you at the Security desk. if not picked up within 24 hours, it will be stored as described above. NO OWNER OR LESSEE SHALL BE ALLOWED TO KEEP AND/OR MAINTAIN ANY PETS OR ANIMALS OF ANY KIND (“PETS”) ON THE PREMISES. An owner shall inform any prospective purchaser or lessee, in advance of any prospective sale or lease being signed, that pets are not allowed. Guests of owners may not bring pets into the building. VIOLATIONS OF THESE RULES WILL RESULT IN FINES AND THE REMOVAL OF THE PETS. Unit Owners currently owning such pets register their pets with the Association no later than – the later of December 31, 2009 or 30 days after the publishing of these Rules & Regulations. Forms for these purposes shall be provided by the Association. Any pets not properly registered as required above will be declared illegal and will be subject to immediate removal; with any costs of removal to be the responsibility of the Unit Owner. Management has the right to personally grant or withhold permission to use these rooms and areas. Any such arrangement must be made with Management well in advance of the planned event, and except for non-profit organizations, shall be subject to a usage fee. No event shall be conducted to which the general public or any persons not personally known to the sponsoring owner are invited. It will be the responsibility of the party who engages a room to leave it in a clean and orderly condition. There will be a charge for Management assistance in preparing for a party or for any necessary cleaning required by the Management requires a refundable deposit against any damage. If these rooms are to be maintained in the manner you would desire when using them, it is necessary to have the cooperation of not only those reserving the rooms, but also of those in attendance at such functions. The reserving unit owner must assume all liability of any kind as to all invitees and all Association property used in the event. To this end, the reserving unit owner must provide proof of in-force liability insurance. NO UNIT OWNER, RENTER, LESSEE, GUEST OR VISITOR SHALL BE PERMITTED TO CONDUCT ANY BUSINESS FOR PROFIT ON OR WITHIN THE COMMON AREAS OF THE CONDOMINIUM. On arrival at the building, all repairmen and outside service people must register at the Manager’s Office in the North Building. The Association’s maintenance employees are not permitted to perform repairs in private units. The Manager keeps a list of competent outside repairmen from which you can choose. During working hours, the Manager, at the request of a Unit Owner, may assign our Maintenance employees to perform emergency apartment repairs, and assess the Unit Owner accordingly. In the case of an emergency originating in or threatening any PRIVATE DWELLING, regardless of whether the owner is present at the time of such emergency, the Board of Directors of THE ASSOCIATION, or any person or persons authorized by it, or the Building Manager, shall have the right to enter such PRIVATE DWELING for the purpose of remedying or abating the cause of such emergency, and such right of entry shall be immediate. To facilitate entry in the event of any such emergency, the owner of each Unit, MUST deposit the key(s) to access their unit, which shall be kept under the control of the Manager. A charge will be assessed if entry has to be forced to effectuate this work, because the unit owner has not provided Management with duplicate keys (which every Unit Owner MUST deposit with the Manager’s Office for emergencies). The Management will maintain a sufficient staff of Security personnel for your safety and protection. The standard of efficiency depends on the cooperation of the unit owners. Please remember, security personnel are here to protect you and your property and should not be reprimanded for challenging an unknown visitor whose name has not been provided to Security in advance. The Security staff is at your service for emergencies and to report accidents, sickness, fires, etc. Report to the Security Guard or Manager anything that appears to be out of order, or any action of a suspicious nature. Apartment owners expecting guests or workmen are required to notify Security (or the Manager) in advance, as described previously. Stringent rules must be met before the admission of any visitors/guests by Security Personnel. Please see the GUEST section for the details. Failure to comply with these Rules will result in any such non pre-registered visitors/guests being denied access to the buildings. All doors which allow entry from the exterior of each building MUST be locked at all times and should not be propped open for a Guest or Owners convenience. An adult must actively supervise children less than 12 years of age playing shuffleboard. Please do not walk on the courts. Equipment may be obtained from the pool attendant. Equipment must be returned to the storage area. Report any broken equipment to the Manager or pool attendant immediately. Every unit is equipped with two smoke alarms that are “hardwired” to the Security area in the Lobby. The alarms emit a screeching noise to let you know when smoke is detected in your unit. One alarm is generally located in the hall near the unit’s entrance, and the second in the hall outside the kitchen. It is the responsibility of each unit owner to maintain these alarms in working condition by the changing of batteries at least once every year and testing them four times a year. Additional smoke alarms are located in all corridors, and are maintained by the Association. SMOKING IS NOT ALLOWED ON OR IN ANY AND ALL COMMON AREAS. This includes, but is not limited to, the Garage, all Hallways, Elevators, Stairways, Public Rooms and Bathrooms, the Lobby, the Health Club/Fitness Center and/or the Restaurant. Smoking is allowed on the Recreation Decks subject to the restrictions and conditions described in that Section. Smoking is also allowed In all privately owned units, toying as all doors connecting the unit to the hallways are kept closed. UNIT OWNERS SMOKING IN THEIR UNIT WITH THE FRONT OR LAUNDRY DOORS OPEN WILL BE SUBJECT TO FINES. All items stored in assigned storage areas are stored at your own risk. Do not, under any circumstances, store flammable merchandise, paints, mattresses, etc. Every unit must have approved storm shutters. Approved shutters must be of fan-fold or roll up design, white and installed against the window wall. No awning or other protections shall be attached to the outside walls of the buildings, and no blinds, shades or screens shall be attached to or hung in, or used in connection with any window or door without prior written consent of the Management as to type and/or location. The responsibility for closing storm shutters prior to a storm or when leaving an apartment for a period of time is totally that of the Unit Owner. A Unit Owner may request assistance for this purpose. The pools and recreation decks are for the use of owners and their guests. An adult must accompany and actively supervise children less than 12 years of age. Infants needing diapers are not permitted in the pool at any time, unless the infant is more than 6 months old and wearing special swim diapers. Florida State Board of Health Regulations requires that a thorough shower must be taken before entering the pool. Persons with contagious or infectious health conditions (such as a cold, an ear infection, a fungus, skin disease or open wounds) are not permitted in the pool. The playing of radios, DVD players, MP-3 players, etc., (except those used with earphones) and/or musical instruments is not permitted on the recreation decks. Beverages and food are not allowed on recreation decks, except when attending specifically designated Social Functions or at the concrete tables across from the restaurant. Chewing gum is not allowed on recreation decks, at any time. Smoking is only permitted on the pool & recreation decks in those designated areas described on the sign(s) posted on those decks by Management, and only when using special smoking receptacles/outdoor ashtrays provided by authorized personnel. CAUTION, regular chairs and lounge chairs on our pool decks may burn if they come in contact with hot ashes. ALL SMOKERS SMOKE AT THEIR OWN RISK. Use of games, tubes, floats, flippers or any other such equipment is prohibited in the pools. “Noodles” are allowed to be used in the pools, so long as they are used responsibly. Beach bathers must remove tar and sand from their feet and legs before entering the pool & recreation deck areas, and dry off before entering either building. Facilities for removing sand and tar can be found at the bottom of the staircase leading from the beach to the deck. Bathers, including children, must be properly attired going to and from the pool or beach. Footwear and robes or other coverings are required for all. Lounge chairs are for your convenience while enjoying the pool and recreation deck only. They are not to be taken to the beach. Also, please do not attempt to `reserve” them by placing personal items on them. A limited number of Beach Lounges are available for the use of Unit Owners and their guests, ONLY through the Pool Attendant, and only during such hours as are set by authorized personnel. Anyone using a Beach Lounge is responsible for returning it to the area set aside for them, against the East wall and behind the beach stairs. Beach clothes or towels must be used on chairs, pool lounges and beach lounges. Unit owners and/or their guests must carry an electronic fob, or any other device provided by management from time to time to open the Beach Gate when going to or coming back from the beach. They must also close the gate each time they use it, to avoid outsiders from entering. Persons in bathing attire must leave must leave and enter the building via 2″d floor service elevators and not through the Main Lobby. Association pool deck umbrellas are not to be opened or closed by unit owners or their guests. They may only be opened and/or closed by the pool attendant or other authorized personnel. As “Limited Common Property”, a unit owner’s use of their terrace is subject to such reasonable rules and regulations as may be prescribed by the Association. Following are the Rules that apply to the use of all terraces. Laundry, bathing attire, wet towels, articles of clothing, cleaning material, etc., shall not be placed anywhere on the terraces. A limited number of small flower pots or potted plants, tastefully arranged, are allowed on terraces so long as they are secured against 84/or protected from moderate winds. Plants that grow beyond their pots so as to become vines in any way are not permitted on terraces. Except for children’s safety netting (which must blend in with the color of the railings), no objects shall be placed on or secured to terrace railings. Please use extreme caution to see that nothing is thrown, dropped, swept from, or allowed to fall or be hosed from your terrace. Smoking is allowed on terraces so long as such smoking does not interfere with your neighbor’s reasonable use of his/her/their terrace. You cannot throw cigarettes or cigars, nor sweep sand or dirt from your terrace. Rugs, mops, cloths, brooms, etc., shall not be dusted, shaken from, nor dried on terraces. The use of terraces for cooking is prohibited. No barbeques can be used or stored on terraces irrespective of whether or not they meet local fire codes. Radios, TV’s, and other sound amplification appliances/equipment should be used on terraces with discretion, since sound carries Into surrounding apartments and terraces. No changes by way of additions, painting, decorating, antennas, large satellite TV dishes, or additions to the outside of an apartment (including a terrace), are allowed without the express written consent of the Board of Directors. The same rules that apply to terraces apply equally to any Common Areas that abut the terraces of any Unit. Additionally, no parties, barbeques or other social events may take place on any Common Areas that abut the terraces of any unit, or of the unit itself. The trash chute is not an incinerator. The trash is removed by truck. Do not place any flammable material such as paint, varnish, etc. in the trash chute, or leave them in the trash room. These items, as well as any small appliances, electronic equipment, furniture, etc. must be taken down to the trash container rooms on the garage level. Newspapers go in the trash bin, and will be recycled. All other refuse MUST be bagged securely before being put down the chute. DO NOT EMPTY WASTE BASKETS DOWN CHUTE Do not place smoldering materials in the chute. To avoid insects, please empty bottles, cans and food boxes before placing in garbage chute. Residents should avoid placing very large sacks of trash, large cartons, boxes or bundles in the chute to avoid clogging. The Board of Directors reserves the right to change or revoke existing rules and regulations and make such additional rules and regulations from time to time as in their opinions shall be reasonable, necessary, or desirable for the safety, protection, cleanliness, and good order of the Aquarius and its residents. The Board of Directors may modify or revoke any consent or approval given pursuant to these rules and regulations. Aquarius is equipped with a modern fire alarm system. Its ringing, however, does not necessary denote a serious fire. A steady ringing of the alarm will indicate the possibility of a fire or that an alarm has been sounded by mistake. Such a steady ringing could also be an elevator alarm or a false alarm. BE ALERT, but take no action other than to check your own particular hallway for smoke or fire. Listen to building Speaker System for instructions. 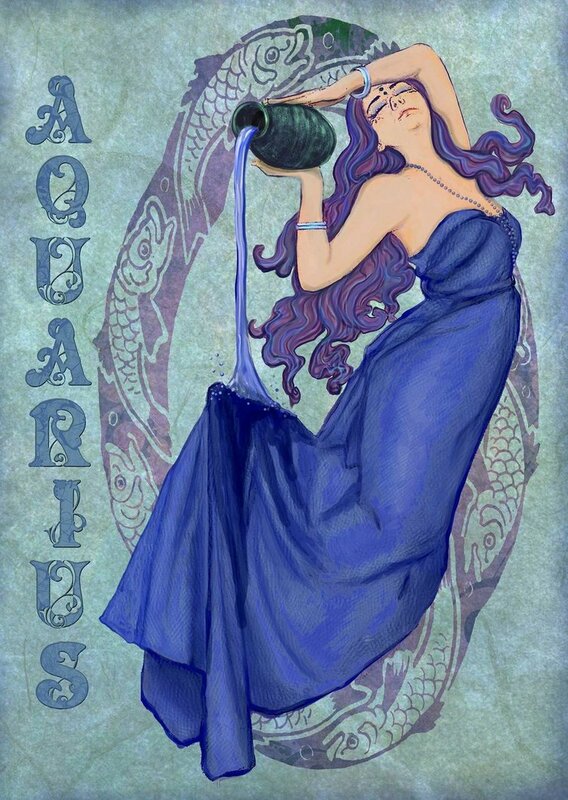 If you see any sign of fire, call 911, call Aquarius Security at 9954-921-0888 and then, go out into your hallway, PULL the lever on the “Local Fire Alarm*. There are two “Local Fire Alarms” in each corridor. The –Local Fire Alarm’ does not conned with the Fire Department. However, it does sound an alarm in your corridor and it lights a floor location signal on the panel in the Security Booth. It should be noted that “Local Fire Alarm’ is a steady ringing sound (an ALERT sound) which would also be sounded if an elevator alarm were activated. So check to make sure which alarm it is. If you have found fire or smoke and have sounded the alarm on your floor, building personnel will go into action immediately and come to your floor and corridor to determine the extent of the fire. If you have a fire in one of the rooms of your apartment and cannot put it out, close the door to that room; shut off the air conditioner and leave the apartment. We could post signs, we could talk to people from now until doomsday, but some people instinctively will go to the elevators in an emergency. All we can say is —DO NOT USE THE ELEVATORS. If you cannot evacuate the apartment and smoke starts seeping in under the doors, pack the openings with wet rugs, towels, etc. Shut off your air conditioner. Provide yourself with wet face towels and cloths, to cover your face and fitter some of the smoke. If smoke has filled the halls and/or you cannot make it to your front door due to smoke or fire, DO NOT PANIC, make your way to the balcony, and — if possible — take your cell-phone with you so that you can call 911 and report your position to the police/fire department. In any event, the fire department is trained to check the balconies, so remain there for advice from the firemen below. Follow firemen’s instructions. Remember, they are highly trained experts in the field of personal safety as well as fire-fighting. For your own security and that of your neighbors, it is suggested that each unit owner purchase a small personal fire extinguisher for their apartment. And in all events, KEEP COOL, avoid panic and give first consideration to yourself, rather than your possessions. And remember too… this is a very well-built building. Very little of it is flammable. But contents are. And such contents, particularly if made of foam rubber, can create serious smoke hazards. Just be knowledgeable and stay alert. If you have a recurring illness or nervous condition which could be irritated by a hurricane, it would be wise to consult your doctor and have him/her prescribe medicines to keep with you during an emergency. Before the winds become too strong for you to go out on your balcony, please remove all furniture and decorative items from the balcony. Most of these can be stored in your kitchen or living room. Storm shutters should be closed by you before the winds get too strong. This is totally your responsibility. Building personnel may be too busy elsewhere to help you. Stock enough packaged foods, canned goods, flashlights and battery powered lights with extra batteries, bottled water and “canned heat” for warming food. If you own a transistor radio, acquire extra batteries for it. Water shortage is a possibility during a hurricane. Purchase bottled water or fill sterilized containers so you have ample water for drinking and cooking needs. You should fill your bathtub or shower base (plastic bag or other stopper can be used). This water should be used for flushing toilets only — not for drinking. Do not leave common area doors (such as stairwell doors or service elevator doors) open, or change or move other common area items before or during the These requirements will be handled by your building staff. As the storm progresses, follow the instructions on TV and radio. Keep up with the latest advisories from the Weather Bureau. If the storm passes directly over this area, there will be a calm period or lull, lasting several minutes to about a half hour, depending upon the size of the eye of the storm and how fast it is DO NOT BE FOOLED — the wind will resume from the opposite direction and often with greater force than before. Remain in your apartment and keep all doors, windows and shutters dosed, including the doors to the bathrooms and bedrooms. Bear in mind, we are in a high rise building and as such are subject to updrafts in the stairwells and elevator shafts which can be very damaging to the and dangerous to people if windows and doors are not closed tightly. In case of an electrical power failure, which is usual at least for a while during such a storm, emergency generators in each building will produce enough power to handle the ELEVATORS, CORRIDOR LIGHTS, LOBBY LIGHTS AND FIRE ESCAPE STAIRWAY LIGHTS. However, it will not take care of any of your apartment lighting, air conditioning, etc. (see the section under “Before the storm”). During hurricanes use of telephones increases dramatically. Accordingly, please try to limit the use of your telephone(s) to cases of emergency only, including problems that may arise within the building (which you should quickly report to the office or the Security Guard). Please make your own arrangements for any necessary clean-up in your apartment, such as wet carpet from seepage water (if any), etc. All service calls will be screened and answered promptly by our Maintenance Division. All calls will be recorded and assistance rendered as quickly as possible. Please report all building damage to the office. After the storm has passed, be cautious of every move_ If you leave the building; DO NOT touch fallen or low hanging wires. AVOID PUDDLES where wires have fallen. Be alert to weakened tree limbs, buildings ‘and bridges. Occasionally illness, particularly if one lives alone, can create difficulty with respect to marketing for groceries, medicines and the normal routine of life. If this should occur, please notify the office and arrangements will be made to help with these needs. Although the possibility of needing emergency lighting has been dealt with in the above listing for “Hurricane Procedures”, a special emphasis is given here to make a point_ Electrical failures can occur from power shortages as well as storms. Everyone is advised to supply his/her apartment with battery powered lights and to keep fresh batteries on hand at all times. This is certainly not a note on which we want to end this “House Manual”, however, let’s be practical. It really might help in an emergency if the office had some way of knowing who to contact if something dire should happen to you while in residence here. Please give the office the name, address and phone number of the person or persons to contact in an emergency; such as next of kin, or perhaps another relative, friend or attorney. Do this NOW, when there is no emergency, so that it will be on file, if needed. This entry was posted in Governing Documents and tagged 2009, alarms, emergency, fire, fire alarm, Garage, house, manual, parking, procedures, rules, security, smoking, swimming. Bookmark the permalink.